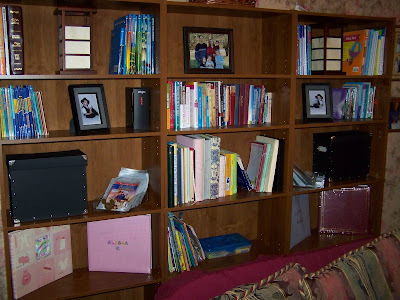 This are the bookshelves that I mentioned in my last post. You just can't beat them for the money! Look at all the empty space I still have to fill! We can't dare leave a horizontal surface unfilled! When I get the decor hung above my new desk, I'll show you a picture of that as well. I am just so happy with all these changes we've been able to make lately! OOOH! I need some new bookshelves to hold our growing library! I really like these. I really like those shelves! And there's so much space on them!